By now, you guys are probably getting sick of “sights and bites,” and are hungry for a real, meaty recipe post. Am I right? After being away from my kitchen for over a month, I went absolutely cray when I got home. I really should have been unpacking, but you know what I did instead? Whipped up a batch of this granola, a green smoothie, and these scones. Oops. #noselfcontrol. Those of you who follow me on Pinterest know that scones have been on my radar recently (even created a new scone-themed board). Now that I’ve dove headfirst into the world of scone-ery (? ), I’ve learned that there are two types of scones, British scones and American scones. The British are world-famous for their scones (pronounced “scon,” if you want to be authentic). British scones are plain and simple (none of these crazy blueberry shenanigans going on across the pond…), and always served with tea. They’re hot, crumbly, melt-in-your-mouth, and barely sweetened. These guys are the perfect vessel for jams, marmalades, clotted cream, butter… you name it. 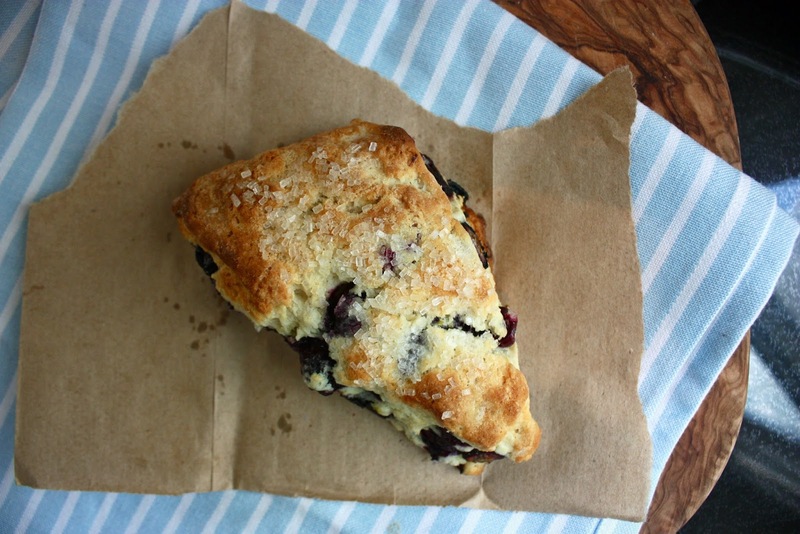 The American scone is really not a scone at all, it’s more like a snazzed-up biscuit. And unlike the Brits, we like stuff in our scones, not on them. We fold in cranberries, white chocolate chunks, fruits, cinnamon chips, even cheddar cheese and jalapenos. Leave it to America to fold cheddar cheese into everything… we seem to have a knack at taking recipes and corrupting them until they’re unrecognizable (Chicago-style deep dish pizza/Auntie Anne’s Bacon Jalapeno Pretzel Nuggets). Sometimes it’s just plain nasty (corn dogs… sorry if there are any corn dog lovers out there…), and other times, that “corruption” can be a beautiful thing (the (in)famous cronut). Kind of like when Dylan went electric, the abandonment of tradition outrages some, but it opens the door to entirely new genius and possibilities for others. Like these maple bacon brown sugar scones. Whoa. I feel kind of sorry for scones. They’re severely underrated. Does anyone actually say that they like scones? People love their blueberry muffins, coffee cakes, and doughnuts; a scone always seems to be seen as that thing that you order when you go to Starbucks at 10pm and the glass case is basically empty. But scones are awesome. They’re 100000x classier than any muffin I’ve ever seen, and they’re wickedly easy to make. Scones don’t deserve the prejudice they are subject to. Especially these blueberry scones. Before I wrap up my rambling, let me tell you about these scones. These scones are leaning toward the American variety of scones, as they’re a tad sweeter than traditional scones and can be eaten plain. They’re jam-packed with summer blueberries. They’re crisp and crumbly on the outside (thanks to a generous sprinkling of raw cane sugar), and fluffy and muffin-y on the inside. Basically, the classed-up cousin of my favorite blueberry muffins in the world. Preheat the oven to 425˚ F. Grate the frozen butter with a cheese grater (neat trick right?!). Whisk together the milk and sour cream. Whisk together the flour, ½ cup sugar, baking powder, baking soda, salt and lemon zest in a large mixing bowl. Add the grated butter to the flour mixture and mix. With a floured rolling pin, roll the dough into a 12-inch square. Fold the dough into thirds, so it’s a longish, skinny rectangle. Then fold that rectangle lengthwise into thirds, so it’s a small square. Chill in the freezer for 5 minutes. Roll the dough into a 12×12 inch rectangle. Sprinkle the blueberries evenly over the surface of the dough, and gently press down (try not to squish them). Roll the dough up to form a tight log (cinnamon bun style). Lay the log seam side down and gently flatten the log into a 12 by 4-inch rectangle. Using a sharp, floured knife, cut the rectangle crosswise into 4 equal rectangles. Cut each rectangle diagonally to form 2 triangles. Transfer to a parchment lined baking sheet. Brush the tops of the scones with melted butter and sprinkle lightly with raw sugar. Bake for 18-25 minutes, until the tops and bottoms are a nice, golden brown. I had half a carton of heavy cream in the fridge. Although I was tempted just to pour it over cereal, I decided to bake it into something. I’m glad I did, I’d choose these scones over cereal any day. These scones are all over the internet — and I can see why. They are moist, tender, and a cinch to make. For the longest time, I did not like scones. I thought they were quite boring compared to fluffy muffins and buttery pastries. Coffee shop scones often resemble heavy, dry hockey pucks. These scones are different. And although they are simple, there is nothing borning about them. Because this recipe uses heavy cream instead of butter, there is no need to whip out the food processor, or crumble butter with your fingers. With a quick stir of a fork, the scones are nearly done. They go into the oven looking like sad, little bricks, yet emerge as lofty scones with a sweet, golden crust. Hot from the oven, these scones melt in your mouth. I left mine plain, simply brushing them with melted butter. They would be wonderful sprinkled with raw sugar for some added crunch, or with dried fruits, nuts, or chocolate mixed into the dough. My family is not a fan of the traditional raisins and currents, but I think that dried blueberries or apricots would be a hit. Of course, these go wonderfully with your favorite jam or honey — and they reheat beautifully. What do you like in your scones? Preheat the oven to 425 degrees F. Use an ungreased baking sheet. will be quite sticky; drizzle in a bit more cream if it seems too dry). piece on the baking sheet, allowing about an inch between pieces. Bake for about 15 minutes, or until golden brown.